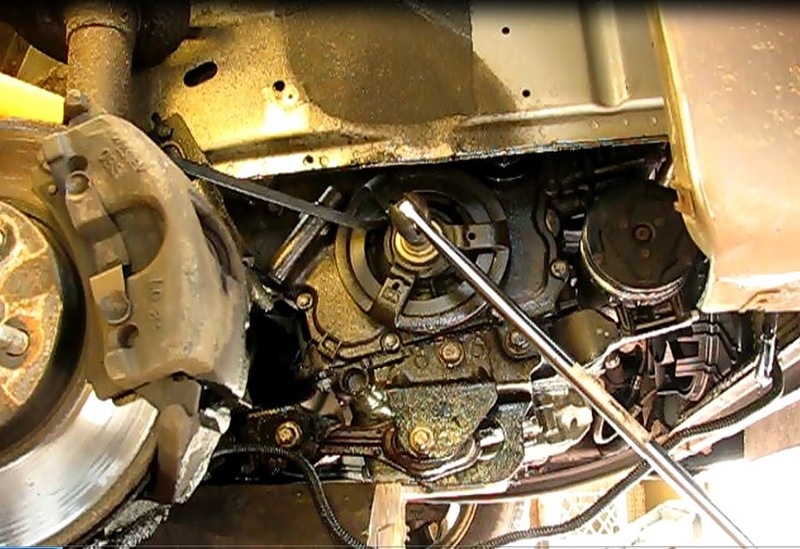 Parts and materials: Crankshaft front oil seal (Fel pro TCS 46112), new crankshaft pulley bolt, serpentine belt (if needed), rags, engine degreaser, grease, oil. .
4) Remove the right front wheel well cover. This is a complicated cover and will take awhile to get off. It is held on by 8 or ten 7mm hex screws. The topmost one is shorter. Two panel fasteners must also be removed, one by the horn in front and one way low behind the wheel. Two wires are also clipped to it, one in the front by the horn and the other along the bottom, clipped on in three places. 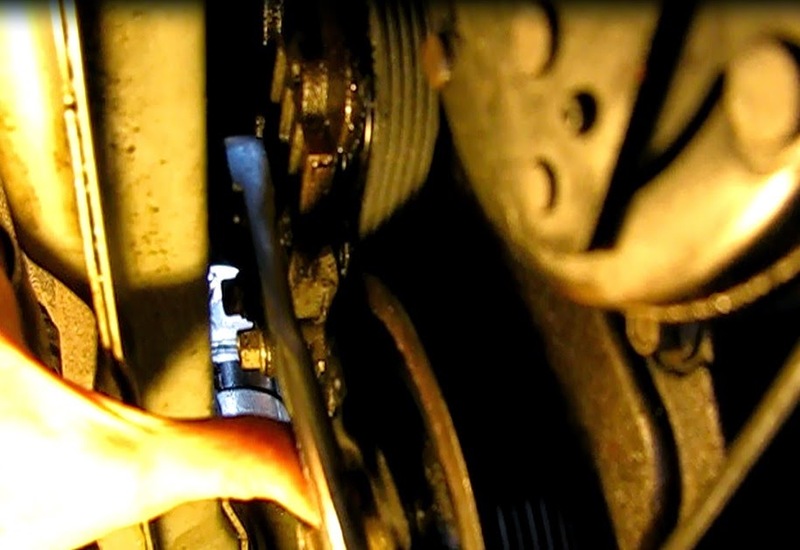 6) Remove the serpentine belt by moving the tensioner upward to release tension on the belt. Use a 3/8” square bar as found on a ratchet in the square hole in the tensioner arm. 7) Remove the crank bolt with a 21mm socket and 24 inch breaker bar. Jam a pry bar or other bar in an opening in the pulley and against a solid part of the car to keep the pulley (harmonic balancer) from turning. 8) Remove the crank pulley. Mine slipped right off. It may be necessary to use a puller. There are three holes for a puller to be attached on the pulley. 9) Remove the bad seal. This one comes out by prying along the underside. I used a six inch long prying tool and it came out easily. 10) Thoroughly clean the belt path. An engine degreaser and plenty of rags will help here. 1) Install the new seal by pressing it in carefully. Put some grease on both sealing surfaces. I used a 2” (OD) piece of pvc to push the seal on. 2) Re-mount the crankshaft pulley. Line up the key slot with the key in the crankshaft and seat the pulley. 3) Install a new crank shaft pulley bolt and torque to 74 foot pounds plus and additional 75 degrees of rotation. A pry bar must be inserted into the spokes of the pulley to prevent turning in the clockwise direction. This works best with two people, one holding the pry bar and the other with the torque wrench. 4) Install the serpentine belt. It runs around the outside of the alternator and AC compressor and crank pulley and then under the tensioner. 6) Mount the wheel and just snug up the lug nuts. 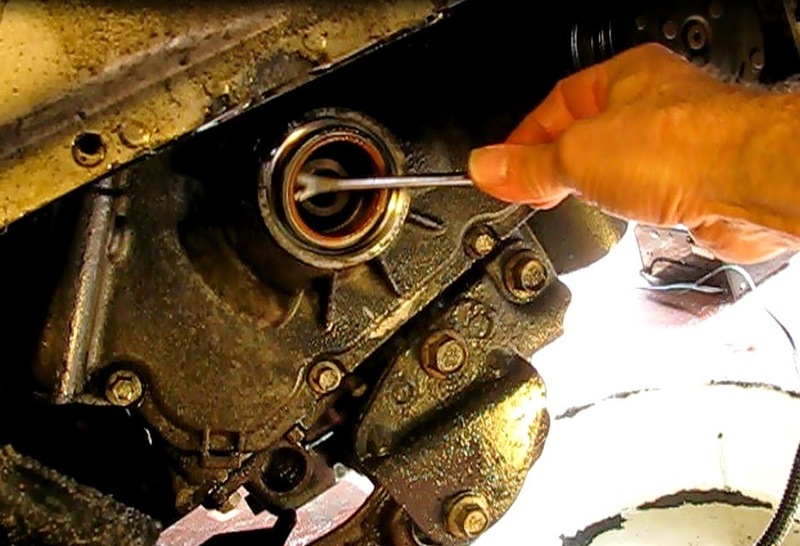 9) Torque the lug nuts and test the car for leaks. Isn't the crankshaft pulley bolt torque to yield? Repair specs indicate a new bolt must be used. Isn't it dangerous to reuse it? This post is incorrect on the torque procedure. The bolt is supposed to be replaced. The torque spec. is 74 lb.-ft. plus an additional 75 degrees of rotation. You are correct. I will fix it. Thanks for bringing it to my attention. I have always been a reader and enjoyed the experience of reading a book. I usually have 3 books going at the same time and as most other CBD edibles readers I can sit in the living room with the family as they are watching TV and can read a book at the same time. I have passed that love of reading to my children as well and nothing gives me more joy then seeing a book laying around that one of the kids is reading, knowing that they will be coming back to enjoy the story. anyone have a part number for the crank bolt on the ecotec crankshaft? I would contact a GM parts department for the bolt.